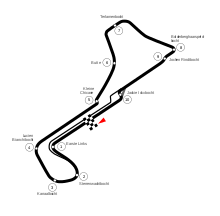 The 1979 Belgian Grand Prix was a Formula One motor race held on 13 May 1979 at Zolder. It was the sixth race of the 1979 World Championship of F1 Drivers and the 1979 International Cup for F1 Constructors. The 70-lap race was won by Jody Scheckter, driving a Ferrari. Scheckter collided with Clay Regazzoni's Williams-Ford on the second lap, but recovered to take his first victory of the season. Jacques Laffite finished second in a Ligier-Ford, having started from pole position, while Didier Pironi achieved his first podium finish with third in a Tyrrell-Ford. The race also saw the first appearance of Alfa Romeo as a works team since 1951. Driving the Alfa Romeo 177, Bruno Giacomelli qualified 14th, ahead of both Renaults and both McLarens, before retiring following a collision with Elio de Angelis in the Shadow-Ford. Patrick Depailler 25 laps (1–18, 40–46); Jacques Laffite 12 laps (19–23, 47–53); Alan Jones 16 laps (24–39); Jody Scheckter 17 laps (54–70). ^ "1979 Belgian Grand Prix". formula1.com. Archived from the original on 9 February 2014. Retrieved 23 December 2015. ^ a b "Belgium 1979 - Championship • STATS F1". www.statsf1.com. Retrieved 12 March 2019.